5:30am alarm, 7am airport, 10am El Obied - no time difference, no business lounge� in fact, apart from getting up early, it's not at all like my once routine commute between London and D�sseldorf. I am met at El Obied International by a chap called Dia (pronounced "dear"). He is an agent at the wholesale crop market in El Obied. From what I can gather he fulfils orders from Khartoum export merchants ensuring the best price, exact quality, and trouble free packaging and transportation. Today he's delighted to be looking after me. We slow down and wave to various people. The phone goes - khawaja this khawaja that. He takes me to his house. I'm in danger of some serious fudulling. Here's a room, unpack, take a shower, take a rest, watch TV, look satellite - 230 channels�. I'll fix us some breakfast -you eat liver? You know Sudanese food? OK, OK it's coming now now. After breakfast we leave my baggage (even though I have no intention of staying there) and we're back in the car. First, curiously we have to go to the wholesale crop market. We meet a colleague. 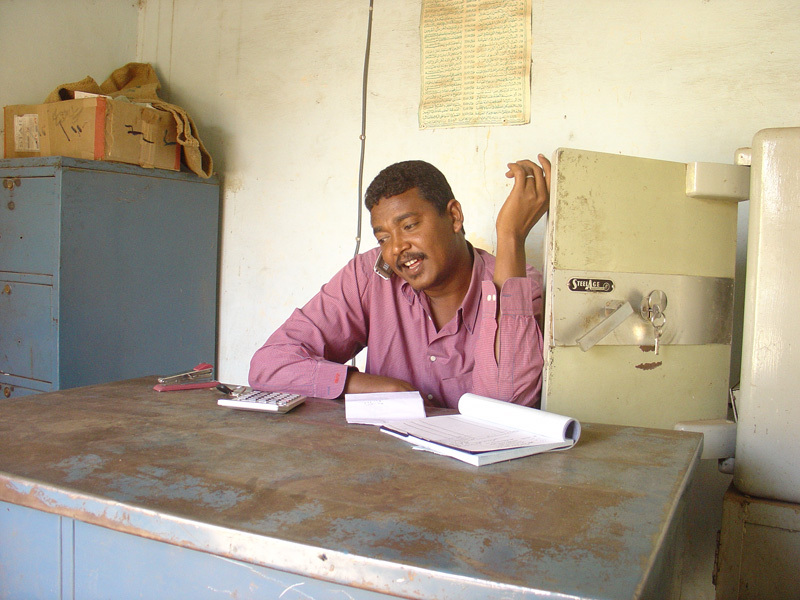 He's a teacher too, also at University of Kordofan - he comes with us. Next stop is the Faculty for Accounting, Business and Information Technology. We meet a nice chap called Sidig. Everyone's very pleasant but I remind them I've come to help with English - any IT will be a bonus, we can arrange after I've get my timetable.